Complete your bedroom decor with the generous drop and flowing grace of the Brielle Essential Bed Skirt. Available in your choice of colors, this skirt will blend with your bedding and keep your bedroom looking elegant and polished. Recommend this item because everything is the same color. My only complaint is that I ordered the gray which looks darker online than in person. The gathered material looks more expensive than the actual price, which is nice. I ordered the King and it has about 1/8 inch from touching the carpet. Lovely bedskirt. The fabric that lays flat between the mattresses is the same fabric as the skirt so you don't have any white poking out between the mattresses, which is really nice. Light weight ruffled bed skirt. I like the weight for a softer look and feel whereas others do not. The drop is too long like others have mentioned. Run a 2-3 inch stitching down the middle. Tucking it in will resolve the problem until your mattress moves. Bed is not that high yet this bed skirt fits very well, does not hang or touch the floor. Would recommend. I just received my bed skirt and it is a perfect match with my comforter. It was a little wrinkled which was to be expected. The fabric was great to iron.....the wrinkles really disappeared without a lot of pressing. I recommend this skirt. It is the perfect length. I replaced the original skirt because it was too long and we kept tripping in the fabric until it ripped........so I am happy with my purchase of Brielle bed skirt.. 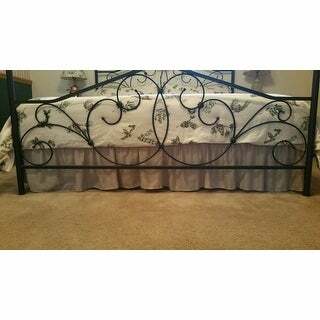 I received the bedskirt in record time and was very pleased with the quality and construction of it. The only problem I have is the color is not the same as pictured. The picture shows almost a burgundy red and it is actually a bright cherry red so it does not look as good with my comforter as I wanted it to. I am keeping it because it is such a good quality for the price. Be careful when you choose the color. The red is not any where close to what is pictured. I ordered the linen, knowing I was taking a chance. It is extremely hard to get coordinating colors when you order online. When it arrived it was really what I would call a dark tan or dark beige. Just wouldn't work for me, so I did return it. However, the fact that the platform is the same color as the drop is genius---don't know why someone did not think to do that a long time ago. So you won't see white even if it shifts. Especially important as it is hard to move on a king bed. So I still gave it 4 stars. Really nice bed skirt! Actually the bed skirt in the indigo color is like a Williamsburg blue which is what I really wanted. In the online pics it looks like a royal blue which I had decided to settle for. The bed skirt is very well constructed. I really like the feel of this bed skirt and the color works, but I would have liked the royal blue to be a little more vibrant. Received in record time.... threw into a quick wash/dry and plopped on the bed. It looks GREAT!!! Better fit than other's I have tried on Overstock. Length is better as well. No dragging on the ground. I purchased the grey king size bed skirt and was impressed at how well made it is.The grey is what I consider a medium grey and the fabric is lightweight, but not see through (at least I can't see through my grey one). 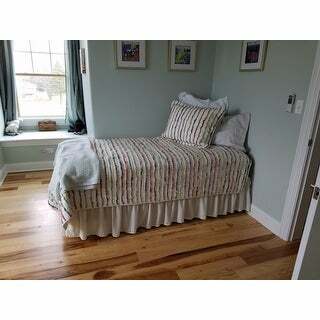 I particularly liked the fact that the base fabric that fits under the mattress is of the same material as the skirt itself, not that "fabric like" woven paper that is used on other bed skirts. There is also piping going around the seams between the top sheet and the skirt itself, which is definitely a nice upscale touch. This was a nicely priced bed skirt (I got mine on sale) and well made. I do recommend it. The ivory matches the coverlets on the bed. It is a little thin, but fine. Wrinkles came out easily when I threw in the dryer with softner. Great neutral color that goes with everything. It is very easy to put on the bed and it stays in place really well. Also is washable which is great. Color was true to the picture. Very nice bedskirt. Well made. Looks nice in the bedroom. Perfect way to dress up a simple bed set. "Is the skirt split at the sides for bed post?" Yes, the skirt is split at the ends & im assuming it will accommodate bed posts. The pic shows it split also. 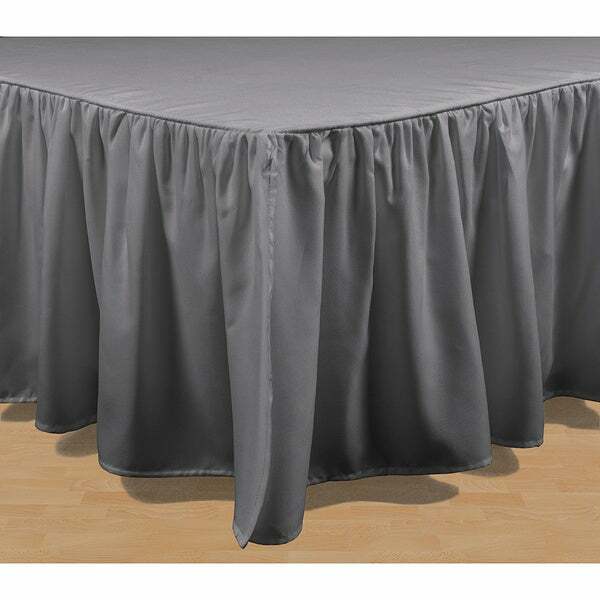 ".Since I need a 12" bedskirt, would this be a good option for hemming up? Or do you think a flat ungathered skirt would be better to hem?" Unless you are a great seamstress three flat would be much easier to hem. I love this, but, that is a good deal of material to cut and hem, if i were you ,i would get the straight ine. Altho, that being said, love the fkow of this! Perfect! "Can someone please describe the ivory to me? Is it off white or a creamy light yellowish color?" I would say its more of a creamy color. I wouldn't say yellow, though. The fabric is lovely, but I had to iron it when I got it. It drapes beautifully. "The Drop-Down lists "California King", but California King dimensions are not shown in the item description, only regular King. Can you verify that this item comes in a true California King size?" "Can you see the box spring thru the bed skirt?" I have the dark blue against a mahogany footboard and you cannot see thru it. Great bedskirt and would purchase again. "Is this a dark gray? Or is it more of a medium gray?" Its a medium gray. Exactly what you see in the pic, although this isn't always the case. "Needing a FULL size....will Overstock ever carry that size again?"